1. Old Haldeman Homestead, 'Scatter Smiles and Sunshine', Northwestern Turnpike, W. Va.
Old Haldeman Homestead, 'Scatter Smiles and Sunshine', Northwestern Turnpike, W. Va. 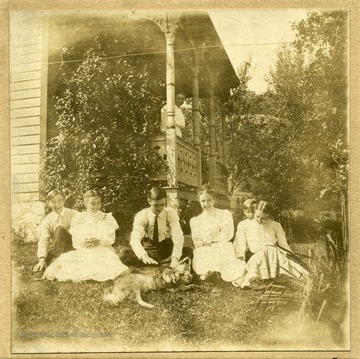 Sitting in the yard, left to right: Jim, Lucy, George Colebank, Ada, Danny, Dorrey Holden and "Ran". Standing on the porch, Ellie.